CarGurus has 639 nationwide RLX listings starting at $12,999. The tech-heavy RLX is Acura’s flagship sedan. This Japanese-built car has had precious few updates since its 2013 model year release, and that tradition continues for 2017. In fact, the only tweaks this year involve the option list. Buyers will note the lack of an entry-level trim, plus the addition of standard active safety equipment. The majority of Acura RLXs sold are gasoline-only models with a 310-hp 3.5-liter V6 engine mated to a 6-speed sequential automatic gearbox. A unique feature is Acura’s Precision All-Wheel Steering (P-AWS) setup. It can steer the rear wheels in either the same or opposite direction as the front wheels to assist the RLX in both cornering and evasive maneuvers. Acura also offers a Sport Hybrid RLX, though only a few hundred make it to the U.S. each year. This version is the basis for most of Acura’s performance claims about the RLX, thanks to its three-motor hybrid drivetrain with a combined output of 377 hp. In addition to a gasoline engine up front, dual electric motors in the rear offer torque vectoring and work as part of the car’s Super Handling All-Wheel Drive (SH-AWD) system. Sport Hybrid versions also get a 7-speed dual-clutch automatic transmission with an electronic shifter. For 2017, the entry-level version is the $54,450 RLX with Technology Package. It includes navigation, a 14-speaker audio system, and the AcuraLink telematics system. There’s also a host of active safety tech, including a lane-keep assist function that can steer the car back between the lines, a collision-mitigating automatic braking setup, and adaptive cruise control, which is capable of following another car during stop-and-go traffic jams. 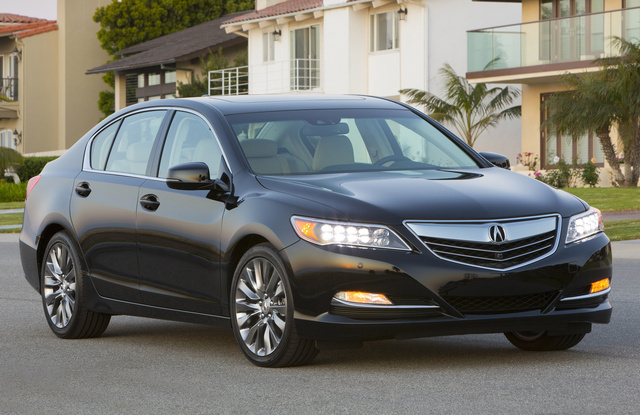 The RLX with Technology Package replaces the base 2016 RLX, which has already been removed from Acura’s website. Although that car cost less, it lacked the active safety features that have become necessary for a vehicle to achieve top honors in crash tests. Buyers who step up to the RLX with Advance Package ($60,450) get all the goodies of the base vehicle, but with additional creature comforts. The driver gets a heated steering wheel, while both front seats are heated and cooled. Rear passengers get a power sunshade on the back window and manual shades on the side windows, plus heated seats and footwell lighting. There’s also an upgraded audio system, plus remote start, a 360-degree camera with front and rear parking sensors, and power folding side mirrors. Both the Tech and Advance trims are rated at 20 mpg city/30 highway/23 combined. In addition to its unique drivetrain, a few features are unique to the Sport Hybrid. The most interesting is what Acura calls a “reactive force pedal”—an accelerator that varies its feedback to the driver based on driving conditions. For example, if there’s snow on the ground, the pedal will become harder to push to keep the driver from accelerating too fast to maintain grip. The Sport Hybrid also has a head-up display. Pricing and EPA estimates for the 2017 Sport Hybrid have yet to be announced, but Acura says it will go on sale later in the fall. From pricing data and press releases, it appears that there will be a single trim—likely the fully loaded Advance package. For comparison, the 2016 RLX Sport Hybrid with Advance Package started at $65,950 and had fuel-economy ratings of 28/32/30. What's your take on the 2017 Acura RLX? Have you driven a 2017 Acura RLX?